Queensland Exporter of the Year 2018! 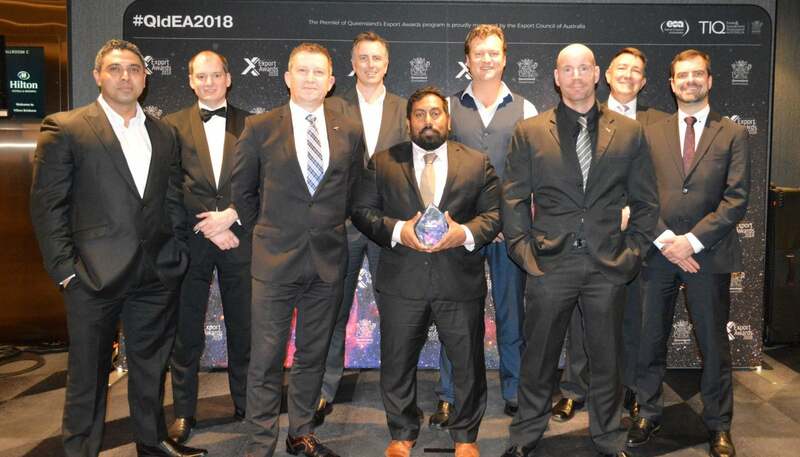 Brisbane, Australia – October 12, 2018 – Tritium Pty Ltd’s global success in the electric vehicle fast-charger market has been recognised with the Premier of Queensland’s Exporter of the Year Award and the Manufacturing Award. The Awards were announced last night (October 11, 2018) at a gala dinner in Brisbane. As a winner of the Queensland Awards, Brisbane-based Tritium automatically progresses as a national finalist in the next Australian Export Awards. The Premier of Queensland’s Export Awards acknowledge the contribution that exporting businesses make to the state’s economy through job creation and increased prosperity in the community. 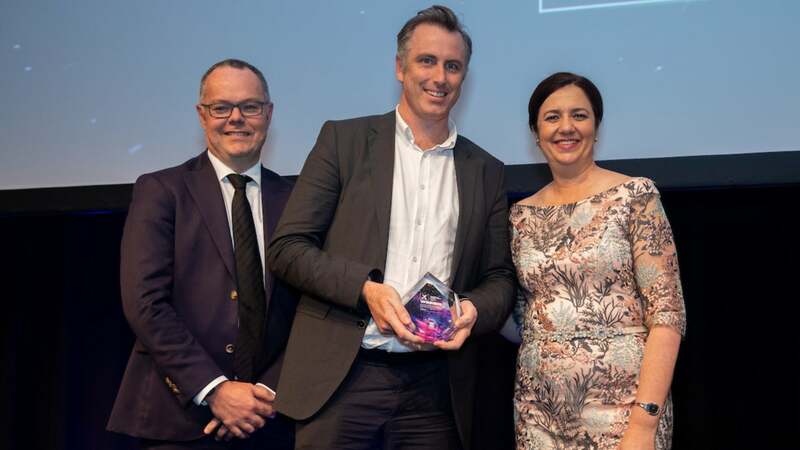 The Queensland Exporter of the Year Award and the Manufacturing Export Award were accepted by David Finn, Co-Founder and Chief Executive Officer of Tritium. David Finn (middle) accepts the award from Annastacia Palaszczuk (right), Premier of Queensland. “While the Australian EV market continues to expand, global markets, particularly in parts of Europe and in the US, are far advanced and so 98 per cent of our business is exported,” said Finn. “It has been very satisfying to compete so successfully on the global stage and I thank all our team and our supporters in Australia for making this possible. · A major deal with the IONITY network to deliver the Veefil-PK to 100 sites across Europe. Tritium EV chargers are deployed in 26 countries and in Australia alone, the company has more than 70 per cent market share. Following the successful export and installation of a dozen HPCs (High-power chargers) to a pilot site in Germany as part of the IONITY network – which aims to install 400 sites in total across Europe – Tritium was chosen by IONITY as a technology partner to supply up to 400 chargers across a further 100 sites in Germany, France, UK, Norway and Sweden. IONITY is a joint venture of the BMW Group, Daimler AG, Ford Motor Company and the Volkswagen Group including Audi and Porsche. To cater for Tritium’s continued expansion internationally and nationally, the company is expanding its operation in Australia. In addition to Tritium’s success in high-performance chargers, the company continues to lead the way in the 50kW DC Fast Charger market, locally and globally. Earlier this year Tritium signed deals to supply at least 40 Veefil RT-50kW DC fast chargers for the NRMA’s charging network rollout across New South Wales in Australia, and to supply 12 Veefil-RTs to NKM Mobilitas Ltd. (Mobiliti) in Hungary. Brisbane-based Tritium is a technology company specialising in the design and manufacture of DC fast-charging solutions for electric vehicles (EV). Established in 2001, to provide power-electronic systems and battery energy-storage applications, it has, since the launch of its first DC fast charger in 2014, become one of Australia’s fastest-growing companies. In just four years Tritium has developed into a leading global DC fast charging supplier, with installations in 26 countries, and it currently holds around 50% of the Norwegian market and around 15% of the wider European market for 50kW fast chargers. In 2016, the Queensland Government invested AU$2.5m in Tritium - the first company to receive investment under a Business Development Fund scheme established to encourage innovative business – and it invested a further AU$2.5m in 2018. Customers include Charge.net.nz, EDF Lumins, Fortum, Grønn Kontakt, IONITY, Proterra and Stromnetz. Tritium’s HQ and main manufacturing plant is in Brisbane, with additional sales and manufacturing facilities in its two key markets of Europe and the US.